And I don't mean that crazy klan flick from the silent movie era... I'm talking the Old Dominion here. The tidewater region of Virginia is home to America's Historic Triangle: Jamestown - the first permanent English Settlement in the New World; Colonial Williamsburg - Virginia's first capital and home to the College of William and Mary; and Yorktown - where the British finally called it quits in the American Revolution, are all within minutes of one another. This is where it all got started and, unlike the malaria, Indian attacks, and starvation the colonials experienced, today you'll find living history, fantastic museums, retail outlets, and timeshare rentals. In Colonial Williamsburg, the restored section of the city, you can meet and greet with talented history interpreters playing the roles of residents from our colonial days. You might even run into George Washington or Thomas Jefferson, if you're lucky. I saw this one fellow confined to "the stocks" for having too much to drink the night before. I told him to try some aspirin and lots of water next time, but he didn't seem to know what I was talking about. Did you know the normal penalty for most misdemeanors was a simple fine, but that if you didn't pay it they publicly lashed you with a whip? Are you kidding me?! Needless to say, I was on my best behavior during my visit. While in the Williamsburg area, I am staying at the Wyndham Kingsgate. From here I can easily get to all of the main attractions, while enjoying the amenities of this family-friendly resort. It features indoor and outdoor pools (including one just for adults), miniature golf, tennis courts, an onsite restaurant, and more. Looks like you can rent a 2 Bed/1 Bath unit on RedWeek.com right now for just $111/night. And if you think you might like to own here, there's a 3 Bed/3 Bath for just $2000. 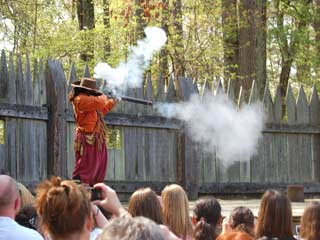 Well, I am going to get back to some living history down at the Jamestown landing site. Maybe I'll see Pocahontas or Capt. John Smith. I sure hope he sings better than Mel Gibson did in the Disney version.